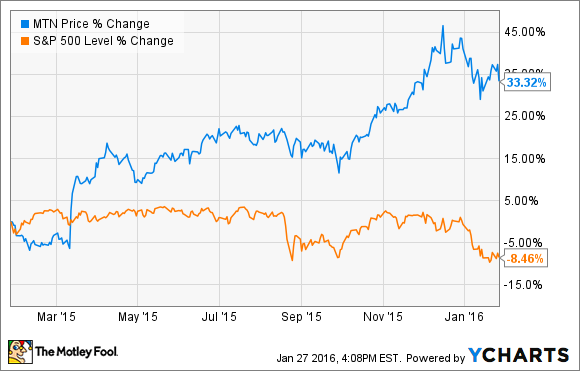 Is Vail Resorts, Inc. a Good Choice for Dividend Investors? Vail Resorts boasts a modest 2% dividend yield but has the potential to be a great long-term income play. Vail Resorts (NYSE:MTN) may have a dividend yield of only around 2%, but it's a good choice for income-seeking investors nonetheless. Its combination of a powerful moat, opportunities for growing and smoothing out earnings, and a shareholder-friendly management team make this a dividend payer you want to own. When looking at a company's yield, it's helpful to look at the recent performance of its shares. For some stocks, a high yield might mean a cratering share price and a deteriorating business. A stock that's growing 20-30% a year might have a low (or lower) yield even if management is committed to growing the dividend. Math dictates that 10% to 15% increases in payout combined with 20% growth in share price will lead to a lower yield. But that doesn't mean the company isn't a wonderful dividend investment. In the case of Vail, the stock is up over 30% in the past year while the S&P 500 has dipped by nearly 9%. A 2% yield, especially for a company that has the growth potential of Vail, is nothing to sneeze at, but had the share price remained flat over that period, the company would yield almost 3%. As a shareholder, I'm happy with the current situation and would love to see a 2% yield, where share appreciation is matched by large dividend increases, for many years. Great dividend investments often come from companies that have durable competitive advantages, or moats. These moats allow the business to have superior margins and predictable cash flow over decades. Vail's mountains are its moat. The company owns many of the most beautiful, non-replicable pieces of real estate in the world. If you want great skiing in the United States, it's likely that you'll eventually come across one of Vail's many properties. These mountains allow Vail to charge more for lift tickets, food, lodging, and other entertainment year after year. In the 2015 annual report, Vail reported a 19% year-over-year revenue increase in lift tickets and 14.6% overall, which includes areas such as Ski School and retail. An investor in Vail should feel comfortable that dividends, bigger each year, will be paid for years and perhaps decades to come. The mountains aren't going anywhere, and Vail is getting better at generating revenue from its most important assets. Five Peaks of Breckenridge Mountain. Image source: Vail. Vail has traditionally been focused mostly in the western United States, with resorts in Colorado, Utah, California, and Nevada. It also has been a largely seasonal business. "Our mountain and lodging operations are highly seasonal in nature," the company explains in the 2015 annual report. "In particular, revenue and profits from our mountain and most of our lodging operations are substantially lower and historically result in losses from late spring to late fall." Vail is working to fix both of these issues, and its earnings should become even more predictable and smooth if its successful at doing so. The company has spread itself to new geographic areas that should help to mitigate the effects of a particularly bad season in the west. It acquired Wilmot Mountain in the Chicago area and is taking advantage of inverted seasons with the acquisition of Australia's largest ski resort, Perisher. The ski season at Perisher is from June to October and should help the company move toward profitability in its spring and fall quarters. Vail is also attempting to make use of its valuable mountain assets all year around with its Epic Discovery initiative. It consists of zip lines, alpine coasters, rope courses, and canopy tours, and it's already been rolled out at Vail, Heavenly, and Breckenridge. It's hard to expect that it will ever contribute the kind of sales that the mountain generates during ski season, but if it can reduce losses during the lean times, this will be a boon to shareholders. Epic Discovery Canopy Tour. Image source: Vail. Vail's payout ratio is 71.59%, which is higher than I generally like to see but is not grounds for concern. The company first initiated a dividend in 2011. In 2012 the payout ratio was 147.7%, followed by 78.4%, 85.1%, and 62% over the following three years. The quarterly payout has risen from $0.15 in 2011 to $0.6225. This is an impressive increase -- more than fourfold -- and the fact that the payout ratio has remained steady shows the company's earnings consistency. The company is at little risk of being disrupted by competitors and should be able to grow revenue by charging more for tickets, food, lodging, and services, while using technology such as a crowd-sourced lift line app to serve more customers. Geographic and seasonal diversity will lead to increased revenues, and management has shown a willingness to aggressively raise the payout in the past. I expect share appreciation and a rising payout for decades to come from this wonderful dividend-paying business. I recommend taking a deeper look and seeing if Vail deserves a spot in your portfolio.